This month, WooThemes released WooCommerce 2.6.0 which introduced a completely new concept for shipping methods. They introduced Shipping Zones. You can learn more about it on their new shipping zones guide. Shipping zones let you create geographic regions and apply specific shipping methods for it. Also, you can use the same shipping method for multiple shipping zoned but with different settings for each zone. Cool, don’t you think? In our plugin, we added the compatibility for shipping zones, and now you can add the Australia Post shipping method to multiple shipping zones with different settings. If you didn’t update WooCommerce to 2.6 you still can use the plugin as we also take into consideration the support for legacy shipping methods concept. Extra Cover and Signature on Delivery can be optional. Making the fees optional was one of the most requested features, so we did it. Now, you can enable the new option “Separate Extra Services” in the plugin’s settings page and the “Extra Cover” & “Signature on Delivery” fees will not be added to the shipping cost in the background. But instead, the plugin will display them in the cart/checkout pages as optional fees where customers can choose if they wanted these extra services or not. A new option to strip the GST(tax) percentage from shipping costs. Since the shipping prices coming from Australia Post is already taxed. You can now remove the 10% tax from the shipping prices. This will be helpful when you add your tax settings in WooCommerce, if you enabled the 10% tax on shipping too, there will be extra 10% added to the shipping price since the price is already taxed. 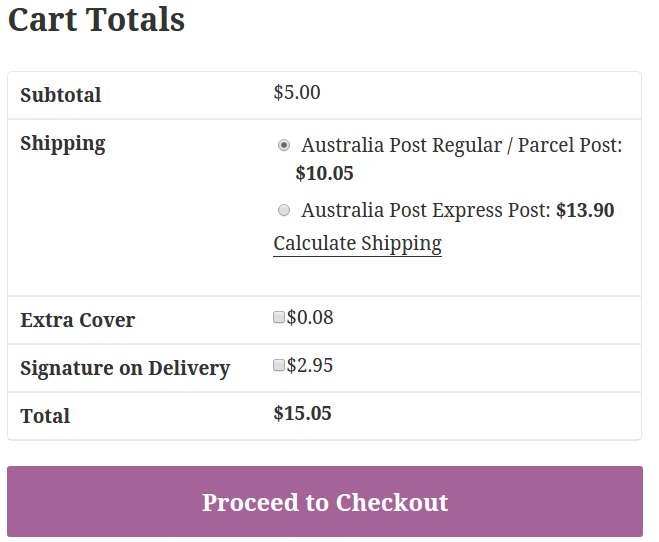 stripping the 10% from Australia Post will solve this issue and the shipping GST value will be displayed correctly in your invoices. Improved: Showing the cheapest shipping rate calculations. Tweaked: User Interface improved by combining the default product size in one field. Fixed: Signature on Delivery caused free shipping prices in some cases. Fixed: Courier option calculations bug. We also added What’s new box so you can know what’s new in the new release you just update. Of course, the box can be dismissed and will never be displayed anymore. 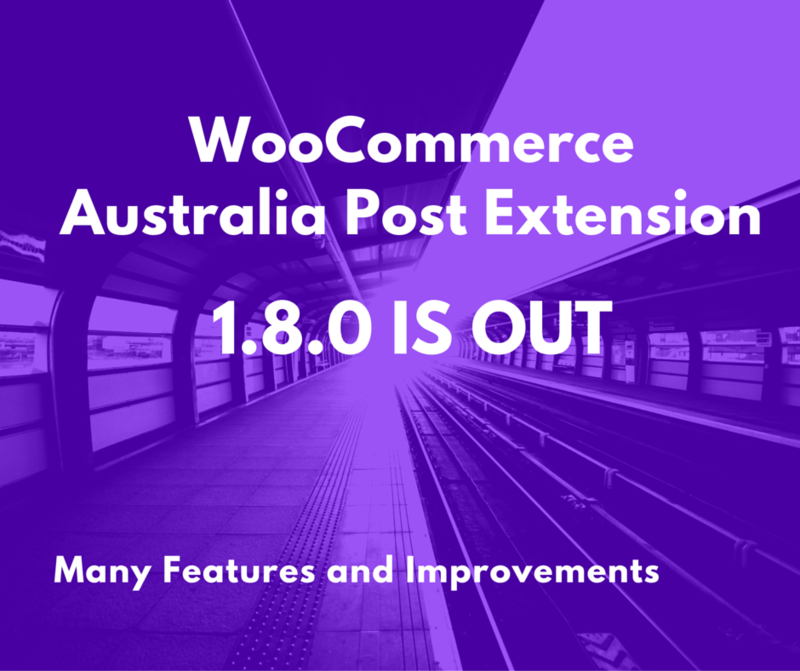 If you have WooCommerce 2.6 installed, and then updated the plugin to 1.8.0, make sure to add the Australia Post shipping method to a shipping zone in order to work properly.